Warning: Boring historical content. May not be suitable for some readers. Reader discretion is advised. If you hated history and geography in high school, you may want to skip the next couple of paragraphs and head straight for the recipe. For the rest of you, try to follow along, but if your eyes glaze over and you start to drool, run, don’t walk, to nearest recipe. Culturally and linguistically, my home province of Québec is unique in North America. The official language is French, and ensuring the continued existence of this island of Québécois French culture in the sea of English-dominated North America, is the defining factor in much of Québec’s policy and politics. A long drop off of a steep cliff in the birth rate among Québecers in the 1960’s led to some changes in Québec’s immigration policy that gave preference to native or fluent French speaking immigrants. Where would these French speakers come from, you ask? France and the rest of Europe, you say? Well it might surprise you to learn that the largest number of people who speak French as a first, or fluent second language is found in Africa, not Europe; over 115 million people in 31 countries. Right up until the 1960’s, France had been giving Britain a run for its colonial money in creating a global empire with colonies or protectorates on almost every continent, including a huge swath of Northwest Africa. So learning to ask “Where is the bathroom?” in French would come in handy in way more places than you had thought possible. Morocco is located on the Northwest coast of Africa, in the heart of formerly French controlled territory, and it is home to the oldest monarchy on the continent. The country regained its independence in 1956, but the French language continues to be the primary language of business and government and is spoken fluently by most urban Moroccans. 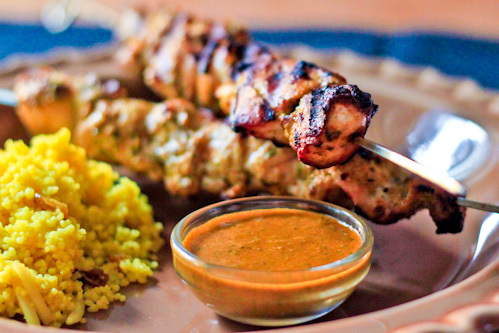 Moroccan cuisine has been heavily influenced by the many outside cultures this ancient civilization has had contact with throughout its history, and it is considered one of the most diversified in the world. It’s also one of the more under-represented cuisines in North America. Further reading on the global distribution of the French language can be found here, if you are fascinated by the topic, or if you are so bored you’ve thought about braiding your dog’s tail hair. Lesson concluded, thank you for your patience. Class dismissed. Why, oh why, did I subject you to all of this historical rambling? Basically in order to be able to say that, not surprisingly, there is a thriving Moroccan community in Montreal, Québec (where I was born and bred, in case you missed it) which means you can find good Moroccan markets and restaurants all over the city. I find history fascinating, and I sometimes wonder if I should have been a historian and not a scientist. I think Historians dress better, which would count as a plus. 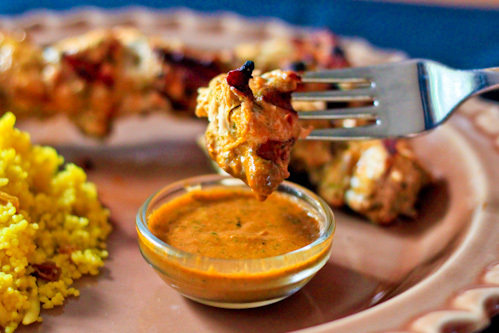 Since Wichita is a tad more Morocco-deficient than Montreal, and since I had a craving, I decided to cook up a Moroccan inspired dish using a Chermoula sauce as both the marinade and the dipping sauce for grilled chicken skewers. Cut the chicken into 1 ½ inch cubes. 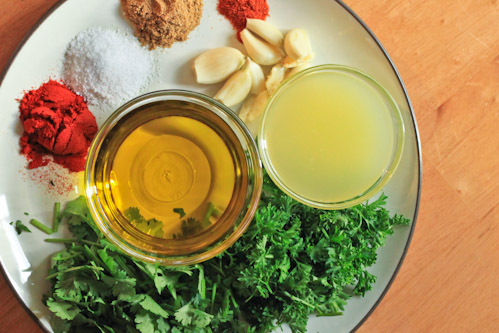 Pour about half of the chermoula over the chicken and marinade in a covered glass bowl or freezer bag in the refrigerator for at least 4 hours or overnight. Thread the chicken onto skewers, about 5 pieces per skewer. 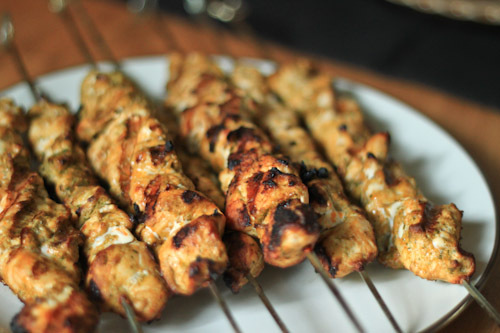 If you are using wooden skewers, soak them in water for about an hour before using. Preheat the grill to medium. Grill the chicken for about 5 minutes per side or until cooked through (165°F). Serve with some couscous and the reserved chermoula sauce for dipping. Place all of the ingredients except the olive oil in a blender and blend until smooth. Slowly drizzle in the olive oil with blender running. Chermoula can be stored in refrigerator for at least a few days. This looks fantastic! I found your blog via Serious Eats. Beautiful photos! Saw this on Photograzing. The sauce looks so good and I can practically taste it after reading through the ingredient list. Can’t wait to try. This would make a great appetizer for a summer dinner party–thanks! Photos are very nice (found you on foodgawker). Melissa: That’s what I though when I found this recipe. Sounded great on paper, tasted even better in real life! Debi: An appetizer is a great idea. I’ll have to keep it in mind for my next party. These look fabulous. And, wonderful pictures! Always looking for a new variation on the classic kebab. This looks amazing…looking forward to trying it! No better time than today to poke around more of our newly discovered sites. Good thing this recipe came up. Sounds deliciously smokey and spicy! Wow, this looks amazing! I had no idea what’s in the delicious sauce -thanks for helping solve the mystery! I got to tell you. Sounds great, Smells great, will probably taste great, HOWEVER, the look of the sauce in the photo and how it actually comes out is VERY different! 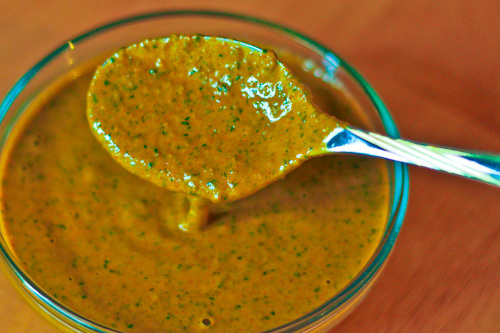 That nice rich orange looking sauce comes out a brownish green. I followed it to a T so something must be missing or the photo is ????. Brownish green. Well huh. I double checked the recipe I wrote up, and it’s the same as the one in the link I provided, so the proportions are correct. The color was orangy green, from what I recall, pretty much like the closeup picture on the spoon. The photo’s are taken in full daylight, so that colors would tend to the warm side, and that may have affected the color balance (especially since I was still getting used to the new camera ;)). As I recall, the color also lightened up as it was blended. If you want to add an extra tsp of paprika, that should brighten it up. Let me know what you think of the taste! I tried the sauce with some moroccan chicken phylo appetizers and it was DELICIOUS!!! What a great dish,my wife found this dish at Costco made by The Fig Tree Food Company,we enjoyed it so much i looked it up on line. Your recipe sounds great, only need chicken to complete it. Going this weekend but I am sure any cut of meat will compliment this recipe. THANKS.